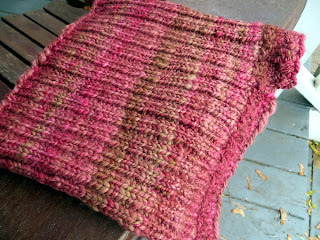 This is one of the things that keep me spinning yarn even though I'm still so very unpolished about it - apart from how addictive the process is, of course. 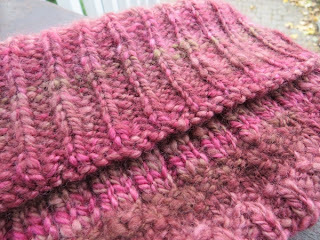 You just can't get yarn that looks like this any other way. Also, in this particular form, it's incredibly dense and squishy - not sure whether you can see the bit of shadow between the side of it and the arm of the chair it's on, but it's got so much air spun into it it's practically a pillow. 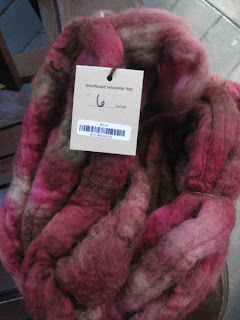 A note on fiber: this was hunk of Blue Faced Leicester wool from Briar Rose. 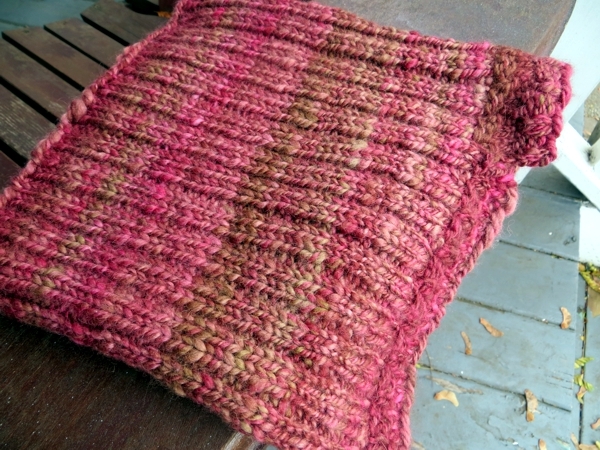 I used my Magical Cowl recipe for Heather's new cowl, and because this handspun yarn was about the same weight as my original Polworth version, I was able to make it the same way again with the addition of just six more stitches. Oh, and a LOT of inches. The final length was almost 9.5" long. As before, the bottom features a flat knit with that's split at the shoulders so you're protected from wind whipping down the front or back of your coat. At the top, the generous length means Heather can pull it up over her nose if it's really cold and gusty, which unfortunately happens a lot in winter in Toronto (though a good deal more in Ottawa, and I don't even want to think what people go through in Winnipeg and points further west.) Or she can fold it down like a turtleneck. The ribbing is intended to hold the wool close and warm, but I worried that it would be too itchy until after the steam blocking (there wasn't time for wet blocking, but steam is good too.) It was amazing how that process softened and relaxed the fibers again, and when she tried it on she said it didn't itch at all. Also: it's pretty much just ribbing, and completely reversible. 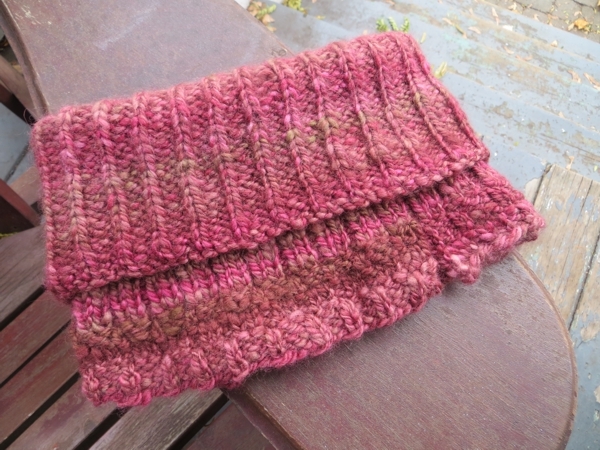 I love this cowl so much. But not as much as I love the matching hat, which is still living dangerously inside my house. I'll have to block it today, and we'll have to go back to see Heather this weekend to hand it over because there is such a colossal risk I might try to keep it! I'm trying to distract myself from such ideas by working on Christmas Socks today, so please send good thoughts. 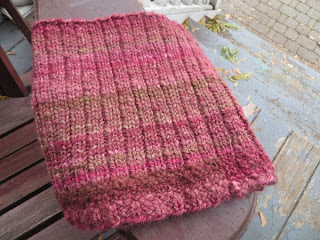 Probably you are working away on gift knitting too, so please accept my own best wishes for you not to love any of it too too much, and I will see you again tomorrow.